Hi Friends! Happy Tuesday! Hope your week is off to an awesome start. 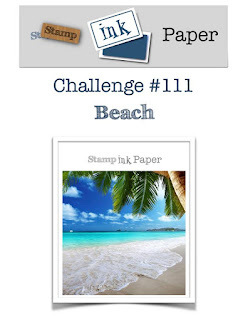 Stamp, Ink, Paper has a super fun challenge this week based on a Travel theme! I hope you'll have a chance to head over and check it out! 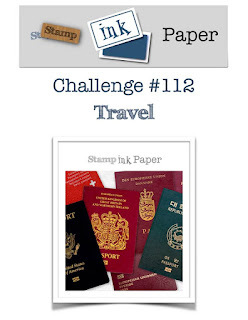 I challenged myself this week to make a travel themed card with a current stamp set. This was a difficult challenge for me because I have a retired stamp set called Traveler that is my go to set for projects like this. Thankfully I remembered the awesome Gina K Designs Kit that I purchased. It included an awesome stamp set called "My Anchor". It has some great sentiments and lovely old truck stamp. I LOVE old trucks! This was such an easy card to create. I started with an 11" x 4 1/4" Basic Black Cardstock base, scored at 5 1/2". 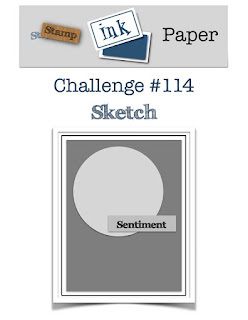 Next I layered a piece of Very Vanilla Cardstock that measured 4" x 5 1/4". My Patterned Paper was some retired DSP from my stash. I used a 3 7/8" x 5 1/8" piece of the Black Street Map Paper to layer over the Very Vanilla Cardstock layer. I cut a piece of 2 1/8 " x 3 7/8" piece of Very Vanilla to matt the Crumbcake and Black curvey design paper that measured 2 x 3 7/8". That left a small border on the top and bottom. I added three loops of Natural Twine and tied into a bow on the left side of these horizonal layers and adhered them with Foam Tape. 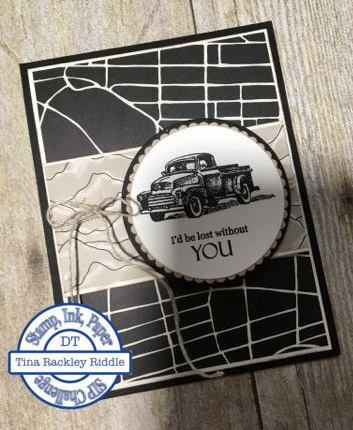 The truck and sentiment from the My Anchor set were stamped on a scrap of Very Vanilla cardstock with Versafine Black Onyx Ink. 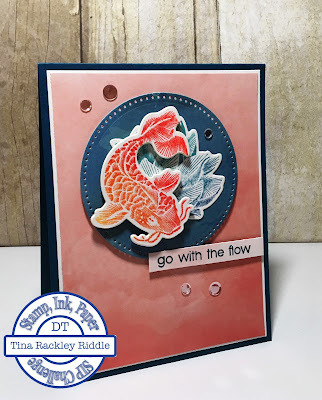 I used SU Layering Circle Framelits Dies to cut the stamped piece into a circle. I layered it on a scrap of Crumb Cake Cardstock that was cut in a scallop and a larger circle of Basic Black cardstock. Hello and Happy Hump Day! 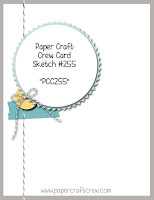 I've been missing in action the last couple of weeks over at Paper Craft Crew but this week I'm back with a Design Team Card for a new fun sketch! I was super excited for this week's card because I finally got a chance to use my July 2017 My Monthly Hero Kit by Hero Arts! I started with a piece of 4" x 5 1/4" 80# Neenah Classic Crest Solar White Cardstock. I inked up the Hero Arts Background Tribal Stripes Bold Prints (July Kit Add on set) with Mustard Seed Distress Ink and added some Spiced Marmalade Distress Ink with a dauber and then sprayed the stamp with some water before stamping it on the white panel. Once dry, I stamped the grassy strip in FSJ Black Licorice Fusion Ink. I then cut out the sun in a scrap piece of SU Pumpkin Pie Cardstock. I wanted to diecut a white circle to go behind the sun but I didn't have a circle big enough so I used my largest circle framelit to cut out a piece of 80# Neenah Classic Crest Solar White Cardstock and then I used the same circle to reduce the size of my sun just a little so that they would matt correctly. I glued them together with FSJ craft glue and then used the same craft glue to adhere it to my cardfront. 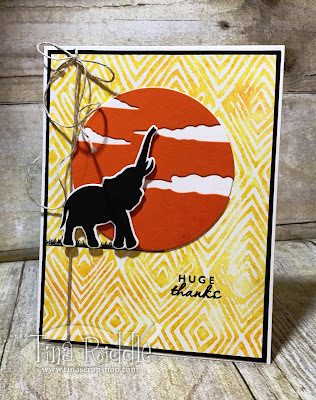 Next I stamped the elephant silhouette in FSJ Black Licorice Ink onto a scrap of the Neenah white cardstock and used the coordinating die to cut it out. I attached it to the front with foam tape. 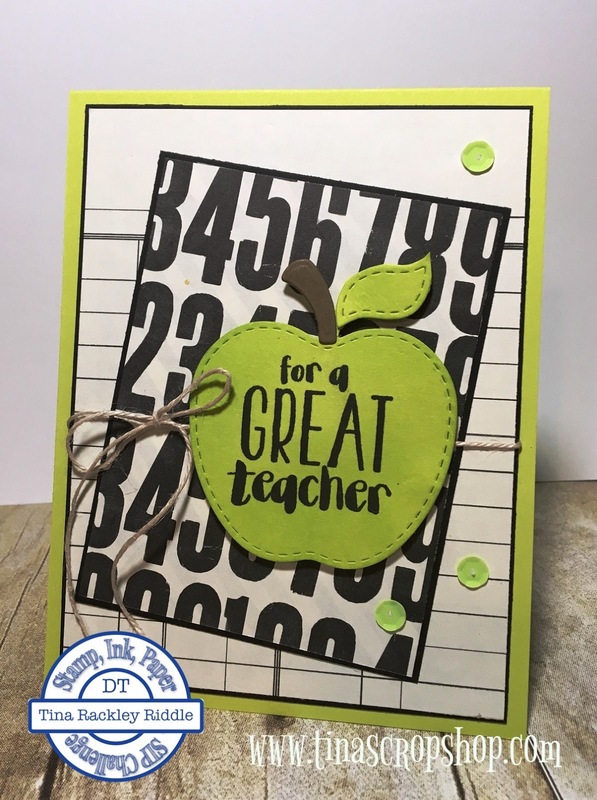 I used my Misti to stamp the "Huge Thanks" sentiment in more of the FSJ Black Licorice Ink and then clear embossed it. I then matted this layer with a piece of SU Basic Black cardstock that measured 4 1/8" x 5 3/8". I used some Journey Natural Thread to run around both of those layers and tied it at the top of the card leaving the tails long enough to curl with the edge of my scissors. I mounted these panels on a 11" x 4 1/2" piece of 110# Neenah Classic Crest Solar White Cardstock that was scored at 5 1/2" for a top folding card base. I was super happy with how it turned out and can't wait to use this kit some more! I think I'll try some blues and purples in the background next time.. What do you think? Hello and Happy Tuesday! If you're on this side of Monday, it's a good day! I've been so busy at work lately I feel like I'm in survival mode.. every day the goal is to make it to the end of the day! I'm sure it will be better soon but the world of Import when it comes to shipping Holiday goods is Crazy! 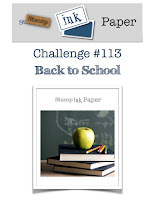 lol So back to the matter at hand, it's Tuesday and that of course means it's time for another Stamp, Ink, Paper Challenge! 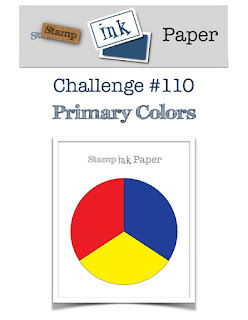 This one is about Primary Colors: Red, Blue and Yellow! So you'll have to hang with me on this one. My hubby and I are planning a cruise at the end of October. We tend to vacation in October or November every year because that is my slow time at work. I have sandy beach and beautiful sunsets envisioned and that is really what keeps me going right now. My upcoming cruise is what inspired this card using the SU Colorful Seasons Bundle. I sponged the background onto a piece of 3 5/8" x 4 7/8" Neenah Classic Solar White 110# cardstock. 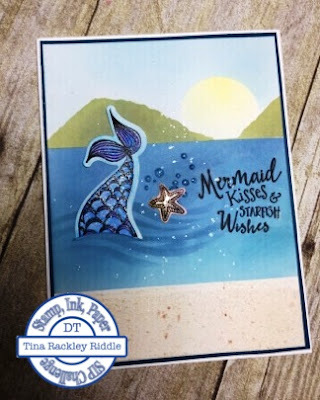 The water is Marina Mist and Pacific Point Ink, the sand is a touch of Sahara Sand, The sky is Sky Blue, Marina Mist and Pacific Point. The sun is Daffodil Delight. I used full coverage post-it notes to mask off the various areas to sponge. 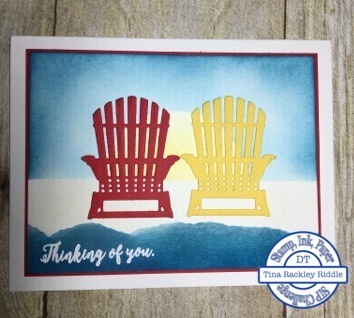 I cut the chairs out of SU Real Red and Daffodil Delight Cardstock. I used my embossing buddy and then Heat Embossed the sentiment in White onto the bottom section of the cardfront. After adhering the chairs onto the front with small dots of liquid glue, I adhered the panel onto a 3 3/4" x 5" Read Red piece of cardstock and then glued that onto an A2 Neenah Classic Solar White cardstock base.